Number of businesses started by migrants in the UK? 1 in 7. 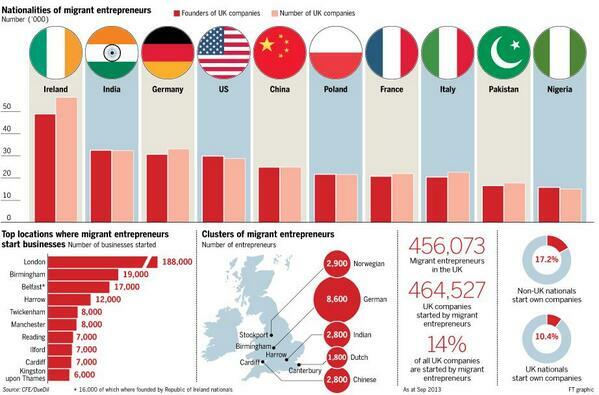 How Many Businesses are Started by Migrants in the UK? Interesting new stats from the Centre for Entrepreneurs have surfaced today regarding the economic contribution of migrant workers, showing that 1 in 7 UK businesses are started by migrants. Wolfestone co-founder Anna Bastek is a keen promoter of the positive impact of migrant workers, and you can read about her story in more detail in Business Matters Magazine. As a business employing dozens of British workers, Anna contributes to the 14% of UK jobs that are created by migrants. The research from the CFE think-tank shows 64% of people surveyed believe the number of immigrant entrepreneurs needs to stay the same or be reduced. This highlights the disconnect between public perception and the benefits migrant entrepreneurs bring to the economy. So what are the key stats? What do you think can be done to help change public perception of migrant workers and entrepreneurs?